When speed is required, USB3 Vision is one of the best choices. Not only do you save time when installing. Also when it comes to transmission rates, it’s a strong contender with up to 350 MByte/sec., subject to the specific hardware implementation. USB3 Vision is ideal for users expecting a device to work intuitively, when the connectors fit. Devices equipped with the USB standard have flooded the market for many years. Be it user input devices, external hard discs or just gimmicks with hard to define purposes. Already from the beginning, web cameras were among the devices with the characteristic rectangular connector. With the introduction of USB3 Vision, there is no longer a barrier preventing professional use of camera with USB interface. Back in 1996 the first initiatives were taken to consolidate all the various interfaces to a common standard. Already from the first drafts of USB, usage was not to be limited to input devices like keyboards and mice, but targeted a broader use. Printer, scanners and external storage devices were also to be supported. This made the development of USB a grand mission. It took until 1998 before USB chip sets for peripheral devices started appearing on the market. Unfortunately users had to wait for Windows XP to get full OS support of USB. Even with the upgrade to USB 1.1, the interface still only provided limited speed (12 Mbit/sec.) and was therefore not widely used. The FireWire standard (IEEE 1394) 400 launched by Apple already in 1995 was light-years ahead of USB. With the upgrade to USB 2.0 around the turn of the century, raising the data rate to 480 Mbit/s, the interface spawned new uses, resulting in a wide acceptance of the hitherto repressed Intel and Microsoft standard. Implementation on a broad scale around 2002 lead to price cuts, making USB lucrative for multi-function printers, web cameras and external storage media. In 2003 Apple upgraded the transfer rate of FireWire to 800 Mbit/sec. USB3 was launched in 2008, and since 2011 a standard feature of almost every PCs. Around this time, Intel and Apple jointly created the Thunderbolt interface, boasting data rates twice those of USB3. In spite of this, USB remains the interface with the widest acceptance in the consumer segment. A contributing factor is that consumers can safely purchase devices, fully confident that they do not have to spend time figuring out which connector to use. In the professional world, some manufacturers tried using of consumer grade USB 2.0 cameras for industrial machine vision. Not until 2013 with AIA’s unveiling of USB3 Vision, displaying a gross data rate of 5 Gbit/sec., a truly value adding solution for machine builders and embedded applications became reality. USB3 Vision cameras, with their native Plug & Play compatibility, have a compact form factor, are quick to install and boast high frame rates. 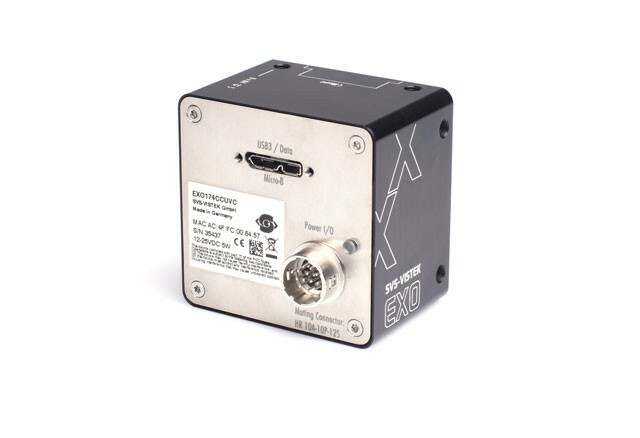 Clearly beneficial for compact industrial CMOS cameras, such as the EXO series, featuring 0.3 to 12 megapixel resolution. USB3 Vision is one of the most cost effective interfaces for machine vision. The latest CMOS image sensors, commonly used in compact cameras with high data throughput, make good use of the high bandwidth, up to 5 Gbit/sec. (gross). The small space requirements and wide acceptance of the standard, found in small form factor embedded ARM-based computers, such as Raspberry, makes USB3 Vision the ideal choice for equipment builders. When it comes to embedded system applications, where the processor, camera and other machine vision components generally are housed together, USB3 Vision is truly in its right element. Having a cable length of five to seven meters is not a limiting factor for these types of system designs. Using repeaters, the cable reach can be significantly extended. Thanks to the inherent 4.5 Watt/900 mA power supply capability of the USB3 standard (in future 100 Watt. Read more under “Power supply via USB”), no additional space is needed for power cables and connectors; further reducing space requirements embedded applications. This enables the use of the USB3 Vision interface for industrial machine vision applications in a wide variety of application and industries, ranging from medical, process monitoring, quality control & assurance to automotive and aerospace. USB cameras are widely used for space-constrained applications, demanding remote processing of high image data volumes. As of 2013 the USB3 is undergoing a revision upgrade to version 3.1. This will push the gross data rate up to 10 Gbit/sec. In comparison with other transfer media, the maximum cable length for USB 3.0 specified at three meters, is considered extremely short, which may be a deterrent from using this interface. Recent practical tests have, however, proven that reliable operation is possible with cable lengths up to 7 meters. Special attention must be paid to selecting the adequate wire gauge for the cable to ensure proper power supply voltage. When using repeaters or optical fiber cables for the USB3 Vision data transfer, significantly longer distances can be bridged. The camera must then be powered locally, with a separate supply connection. Übertragungsdatenraten und Kabellängen von USB3. With USB 3.0 the number of leads used for data transmission was increased from one to three twisted pairs. In addition to the outer shielding, the two additional pairs are separately shielded. This allows the data rate to be increased threefold while providing backwards compatibility of the cable with interfaces only supporting USB 2.0. 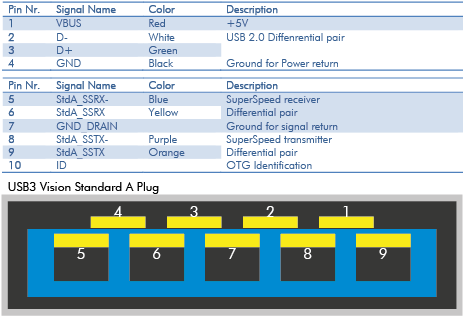 With a cable design featuring double shielding frequencies of up to 5 GHz are possible - Even as much as 10 GHz for shorter distances (read more in 6.8.2.1 of the Universal Serial Bus 3.1 Specification, Revision 1.0). For more demanding industrial use, connectors with standardized locking screws, in addition to the existing consumer style connecors, use are also available. Similar to USB 2.0, there are also many connector variants for USB 3.0. They all have the common design feature of being non-reversible. With the Type C connector, a reversible connector becomes available. This is convenient for trouble-shooting the cabling. The Type A female connector is most common, which is also the standard configuration in computers. The blue color-coding of USB 3.0 makes it easy to differentiate it from 2.0. In addition, you may occasionally find connectors with turquoise or red color-coding. These identify 12 and 24V systems, respectively. In devices an even wider choice of variants are found. (Type B, Mini Type B, Micro USB, commonly used for mobile phones and two Miniature B variants). The USB 3.0 Micro-B is the most common female connector in USB 3.0 devices. USB3 Vision cameras from SVS-VISTEK feature the USB 3.0 Micro-B connector, which is also commonly used for external hard discs. The standardized power supply voltage is 5 V DC. Due to resistance in the cable, a slight voltage drop must be anticipated, resulting in the voltage falling as low as 4V. Going from USB 2.0 to 3.0 the driving current of 500 mA was increased to 900 mA, providing 4.5 Watts of power. As the standard evolves to USB 3.1 even higher drive current will be possible. Regulated in 6 steps, designated 0 through 5, ‘Power Delivery’ will be capable of providing 10, 18, 36, 60 and 100 Watt. Immediately following connection of a device, the host queries the unit’s Device Descriptor. This contains manufacturer and product ID, as well as data identifying the device class of device and which generic driver to use. The generic driver can be substituted with a dedicated device driver. This facilitates full access to all of the camera’s functions and features, over and above the capabilities of the generic driver. Every SVS-VISTEK camera is delivered with the device drivers on a storage medium. The USB3 Vision standard identifies each camera as a hub, and as such allows the devices to respond to and execute both generic and individual drivers and protocols to suit your application needs. Commonly known as “Isochronous Transfer”, it defines time-dependent data transmission. In accordance with this protocol, several devices can negotiate time slots in which to transmit data to a host. In its current state, USB3 Vision only allows Bulk Transfer. This allows non time-critical, larger blocks of data to be transmitted when no isochronous or interrupt transfers are scheduled. In order to warrant the full bandwidth to the camera, we recommend only connecting a single device to the host, and not to burden it with any additional devices. Bulk Transfer is safeguarded by a checksum, and is applicable to devices having a minimum 512 Byte buffer memory and classified as ‘high speed’ by the USB 3.0 standard.